Do you recall what the Decimal sleeve looked like yesterday? No? Check it out here. I was all excited because I was nearly done with the decreases and almost finished with it. When I got home yesterday, I realized that the thing is simply too big. WAY too big. Big enough to fit around my body (almost) big. Seriously – it was HUGE. I decided I didn’t like it. In fact, I hated it and knew that I wouldn’t ever wear it with such gigantic sleeves. I took a deep breath and knew what I had to do. I took out my ball winder and frogged. Those keeping count will know that this is the second time I’ve frogged this sleeve. Ah well, I’d rather knit something that I’ll actually wear! My first thought after frogging was that I’d just cast on a smaller number of stitches, but still make the sleeves 3/4 length. Then I thought more about it and decided that short sleeves might suit this very well, especially for wearing in the summer. So, that’s what I’m doing. I cast on the number of stitches I should have after the decreases and I’ll work the ribbing, 3 repeats of the bottom lace pattern, a few rows of the eyelet lace and then join it to the body. In my mind, I like how this looks, but we’ll see how I feel about it after I’ve knit it! On the plus side, this shouldn’t take me very long to knit compared to the previous sleeve. Today, as promised, I have a picture of my Mini Mochi socks! If you look closely, you can see the green waste yarn where the heel will be. I’m guessing I could probably get a pair of socks out of one skein if I did the ribbing now, but since I have two, I’ll make the leg a bit longer first. 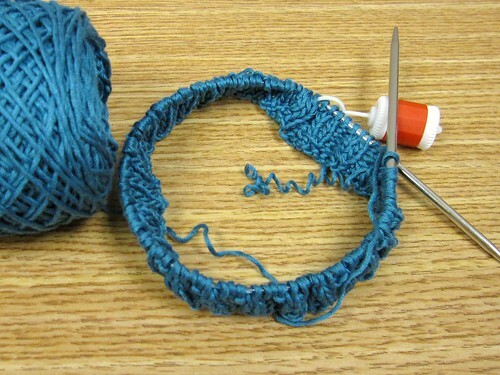 I love working with this yarn and really like how it’s turning out. 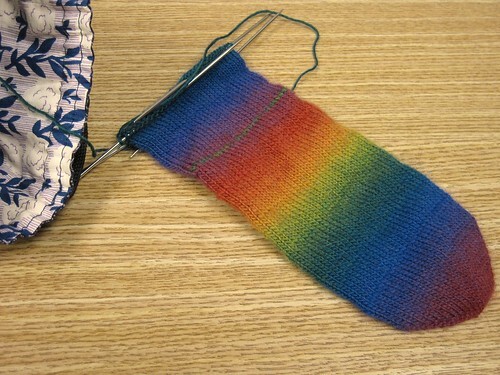 I’m thinking of doing a pair of striped socks with this yarn similar to the ones I’ve seen people do with Noro sock yarn. I think that would look nice. What do you think? Should I give it a go? I do believe I’ve mentioned it here before, but in case I haven’t, I’m in a few sock clubs this year. Recently I received two packages from the Knitting Purls Indie Dyer Sock Club. One was the March shipment (it was late due to an error from the dyer and I offered to wait to receive my skein) and the other was from this month’s shipment. I’ve never knit with yarn from either of these dyers, so it should be interesting to see what I think. 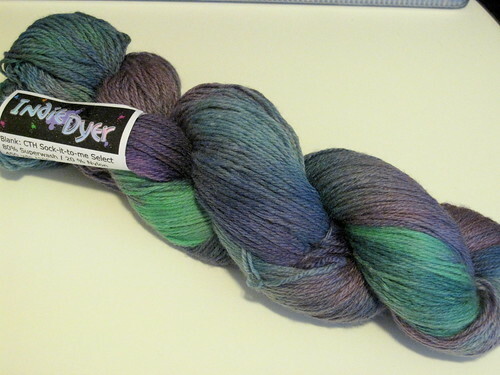 I’m always looking for new folks to purchase from and I especially love supporting independent dyers, so I knew this club would be perfect for me. The March shipment was from Indie Dyer. The yarn is the Sock-it-to-Me base and the colorway is Flowers and Showers. I’m not sure how I feel about it yet. Seems soft and I like the colors well enough, but we’ll see what I think once I’m working with it. The May shipment was from Tempted Yarns. I’ve heard a lot of good things about Stacy’s yarns, so I was excited when this showed up in my mailbox! It’s the Good Grrl base and the colorway is First Spring Iris. I love purple (one of my favorite colors), so it’s no surprise that I really like the color of the yarn. It’s quite soft and springy. I think it will knit up nicely. I haven’t decided on a pattern yet, but I’m looking forward to knitting this up! 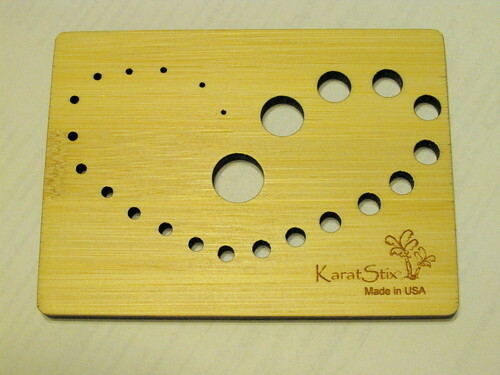 One last thing to show you before I go is this fantastic needle gauge I got from KaratStix. It’s handmade from bamboo and absolutely beautiful. I love how it has the 1/2 sizes for smaller needles and goes from US sizes 0000 to 15 (also has mm sizes on it). Totally worth getting if you ask me. I’m always afraid I’m going to break my metal or plastic needle gauge and this is about 1/4″ thick, so no worries there. It would make a lovely gift for a knitter, too! There’s other products they offer and they’ll even do custom orders (right now it’s a bit of a long wait, but TOTALLY worth it, IMO). The shipping was really fast, too! That’s all I have for today. In the next few days I’ll be migrating my blog over to my own domain, so keep your eye out for a post about that in the near future (this is assuming things work the way I want them to, of course, but it’s coming SOON!). Happy crafting! Ugh with the Decimal! I hope it works out with the short sleeves. I love the blue you picked out for it. 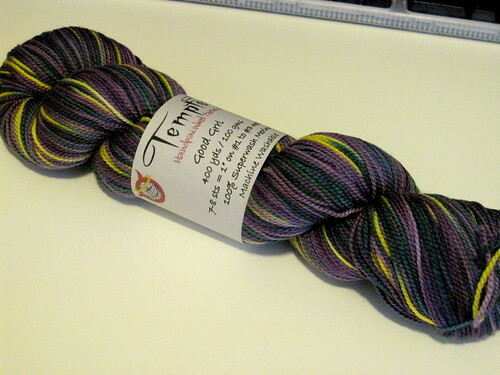 The Mochi socks are beautiful with all the colors, and I really am loving Tempted’s sock yarn. I like the yellows in there with the purples. 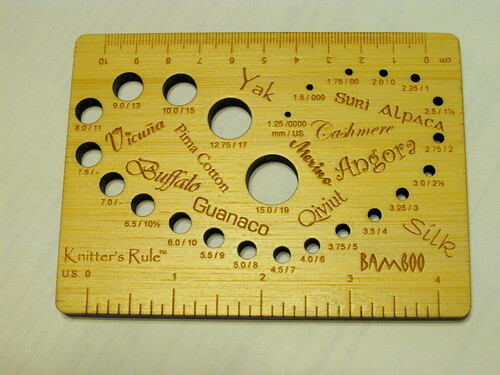 I’ve never seen a gauge like that one, but it is lovely! Good buys Lindsey!! i cant wait to see what you do with your gorgeous yarns and your mochi socks look like so much fun!